BRITISH POLITICIANS WILL resume campaigning today, with the general election now less than two weeks away. Campaigning had been suspended by all sides following the terror attack in Manchester on Monday night, and the issue of security is expected to dominate the political agenda in the coming weeks. In a poll released by YouGov this morning, Labour is shown to have made further gains on the Conservatives strong lead. At the beginning of the campaign, the Tories’ lead was in double digits. Now, it has only a 5-point lead, with 43% and Labour at 38%. Commenting on its poll, YouGov said that while it looked like the Conservatives were losing ground “it is worth bearing in mind that a lot has happened in the past week”. It said that it “will be able to be more confident about how voting intention settles down over the next few days”. 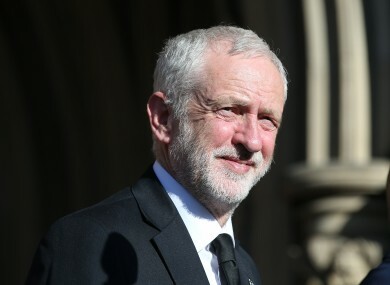 In a speech to be given by Labour leader Jeremy Corbyn in London later today, he is expected to say that the “war on terror” has failed and that it is the responsibility of the government to minimise the risk of attacks by giving police the funding they need. The veteran campaigner will say that more funding would be provided for the NHS and security services to make sure people are “not protected and cared for on the cheap”. Prime Minister Theresa May will not, however, be campaigning today as she is attending a meeting of G7 leaders in Sicily. At the summit, May is expected to emphasise the importance of tackling the spread of terror online by urging internet companies to do more to remove extremist content. UKIP, meanwhile, was attempting to improve on its poor polling and representation in parliament when it published its manifesto yesterday. Advocating a tough line against Islamic extremism, its author Suzanne Evans said that May “must bear some responsibility” for the Manchester attack due to policing budget cuts. The general election takes place on Thursday 8 June. Email “Labour catching up in polls as UK politicians resume campaigning after Manchester attack”. Feedback on “Labour catching up in polls as UK politicians resume campaigning after Manchester attack”.